Remember, two blog posts ago, when I mentioned that the recent split of the stratospheric polar vortex might lead to a highly persistent ridging pattern over the Pacific lasting multiple weeks? Well, that did happen…except that the ridge set up farther west than anticipated at the time. Thus, instead of a weeks-long dry and warm spell in California, we’ve been experiencing something close to the opposite: an extended period of wet conditions with well below normal temperatures, characterized by active weather and in some cases very low snow levels. Some of the highest peaks in the San Francisco Bay Area, for example, currently have accumulated a snowpack over a foot deep; the beaches of the North Coast near Eureka and Arcata have experienced accumulating snow twice in the past 10 days; and snowpack in the Sierra Nevada is now slightly above average (this is now genuinely newsworthy in a warming world!). How did this happen? Normally the polar vortex is strong, and is associated with a band of strong westerly winds at upper levels of the atmosphere (known as the polar jet stream). When the polar vortex is disrupted in the stratosphere, however, that disturbance can propagate back down toward the troposphere (where we live), and wreak havoc by destabilizing the tropospheric polar vortex and subsequently the jet stream. Lobes of frigid Arctic air can then “leak southward” into the mid-latitudes–resulting in truly extreme west-to-east temperature differentials and often producing unusual weather conditions across different parts of the Northern Hemisphere by locally (but not generally) energizing the jet stream. Right now, a very persistent blocking high pressure system has set up shop over the far North Pacific in the Gulf of Alaska–just far enough west of California to allow storm systems to drop almost due southward along the West Coast. Meanwhile, a big chunk of displaced Arctic air has been sitting over British Columbia in recent days–acting as a source for very cold air over the Pacific Northwest and far NorCal. Notably, Seattle is currently experiencing a long-duration snow event of a magnitude that hasn’t been seen in quite a few years–the city itself has broken nearly every February snowfall record there is to break, and more is on the way! Simultaneously with all this snow and cold excitement in the north, a strong extension of the subtropical jet stream has been edging ever-closer to California in recent days. Any time a cold Arctic airmass, strong subtropical jet, and ample subtropical moisture are in close proximity, the forecast is likely to be challenging. And that is certainly the case this week! Even the best-performing weather forecast models have been offering wildly varying predictions from what might happen this week–ranging from a near-apocalyptic rain-on-snow flood event to a rather run-of-the mill rain and mountain snow event. Fortunately, the really dire-looking scenarios from last week appear extremely unlikely at this point, but the risk of at least two strong storms and the potential for some fairly widespread flooding are still on the table. Two major storms are likely this week, with the first likely to develop rapidly off the coast tomorrow before moving in by Wednesday morning. Widespread rain, strong winds, and mountain snow is expected with this first wave, though models *still* disagree on whether this will be a moderately or very strong storm. Even more importantly, they vastly disagree on whether a large plume of deep subtropical moisture will become full entrained by the cold front–producing anywhere from a moderate atmospheric river with modest snow levels to a rather extreme atmospheric river with rain to very high elevations. Further complicating things: the pre-existing cold airmass could actually allow for trapped cold air to bring snowfall to the northern Sacramento Valley floor at the onset of precipitation! So it is possible that snow levels across portions of interior NorCal tomorrow could locally range from 500 ft (with snow in Redding) at precip onset, rising dramatically to 7000-8000 feet later in the day and then perhaps as high as 9000+ feet at some point during the event! Also: the latest model solutions are suggesting the possibility of a rapidly-developing, double-barreled surface low offshore over the next 48 hours. That secondary low pressure area may form the basis for storm #2. Will it be associated with another atmospheric river of some strength/temperature? That seems pretty likely, but not certain. But will it be strong or weak, or warm or cold? I genuinely don’t know! I’ll emphasize once again that it is unusual to have so much forecast uncertainty on such a short timescale–and as a testament to the complexity of the synoptic pattern evolving this week over California. Some flooding likely this week, especially in/downstream of Sierra Nevada. But how much? 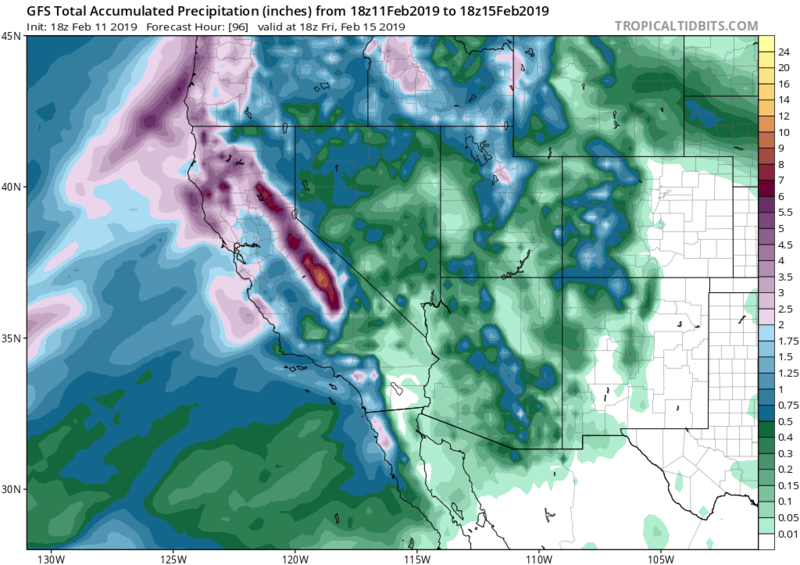 Flood watches are going up all across the state as I type, and for good reason: parts of the Sierra Nevada could see upward of 3-6 inches of rain on top of a very substantial snowpack, which could lead to significant flooding issues. Even coastal areas may see increasing hydrological impacts, given very wet antecedent conditions and saturated soils. 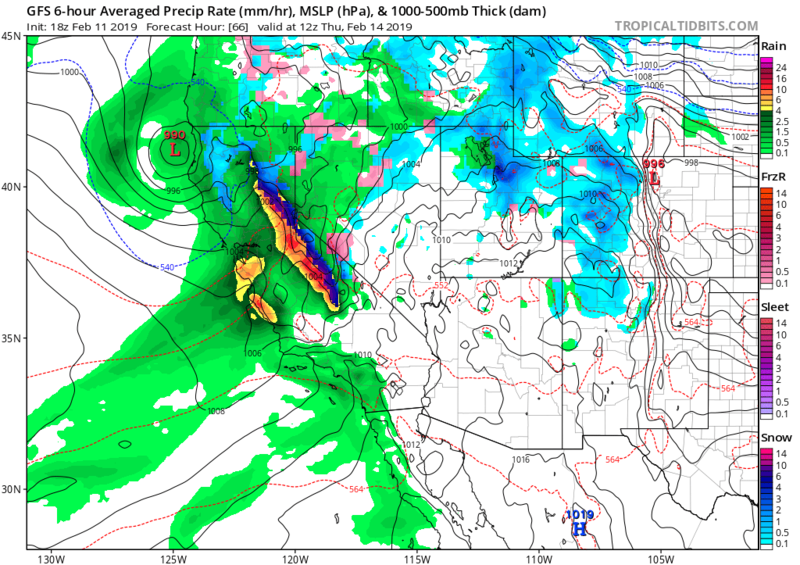 The coastal region–especially SoCal–may fare okay as long as precipitation rates don’t become unmanageable, though that will probably depending on how much the offshore surface low strengthens and how much subtropical moisture the second atmospheric river contains. But the bigger concern is in watersheds draining both the eastern and western slopes of the Sierra Nevada–where there is both a lot of snow to melt, and where a lot of new precipitation is expected to fall. At this point, the potential appears to be there for a significant–but not extremely severe–flood event in some areas, though given the forecast uncertainty that may be ratcheted up or down slightly over the next 48 hours. Rainfall totals in SoCal don’t look quite as impressive as earlier thought, since despite the presence of a very moisture subtropical moisture plume there won’t be especially strong dynamics to squeeze all that moisture out as precipitation. But that will again depend on the exact evolution of the offshore system over the next 48 hours, which is far from certain. In other words: stay tuned! I‘ll continue to have more regular micro-updates on Twitter as this event unfolds. And what about the long range outlook?